It’s been ages since Preston’s last blog update. 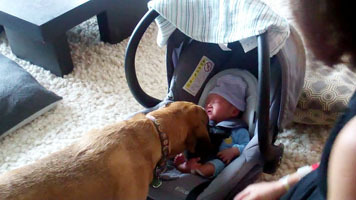 Taking care of a human baby is NOT easy! Baby Nolan is keeping Mommy and Daddy extremely busy. A month ago, Mommy and Daddy brought Baby Nolan home to meet Preston. They had been waiting for this day for months. When the big day finally arrived, Mommy came home and greeted Preston first when Daddy was waiting outside the house with the baby. Then Mommy asked Preston to stay in the living room while Mommy introduced the baby to him. Here is a video clip of Preston meeting Nolan for the first time and learning who Nolan is. Even though it was not love at the first sight for Preston and Baby Nolan, Preston quickly accepted Baby Nolan as a new family addition. The first couple of days after Nolan came home, Preston must have sensed Mommy and Daddy’s anxiety whenever the baby was crying. He got very stressed and started barking and howling. Mommy and Daddy gave Preston lots of praise, kisses and of course, treats to help him develop a positive association with the baby. As Mommy and Daddy became more comfortable with handling the baby and Preston was reassured that the baby noises were normal, Preston started showing affection towards his baby brother.